On 28 March 2009 I published an article describing the six classic national finals of British baseball’s post-war era, where a classic is simplistically defined (for reasons justified in the original piece) as one where the deciding game [a] went to extra innings or [b] had a winning margin of a single run. 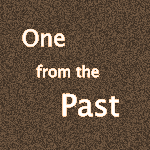 That article noted that there were also six finals in the pre-World War II period that would be defined in this way as having classic status. I’ve been scrambling round for several years now, trying to piece together details of those earlier six finals, and below I present the still-incomplete findings. For available details on all pre-World War II national finals, click here. The cup draw in 1900 was as follows. First round: Chesterfield vs Belper (4 August); Ilkeston vs Nottingham Forest (11 August); byes — Derby County, Derby. Semi-finals: Derby County vs Derby (28 July); Chesterfield or Belper vs Ilkeston or Nottingham Forest (18 August). Derby advanced to the final of the cup before four teams had played their first-round games. Perhaps the bye for the two Derby teams was engineered to ensure that the town would be represented in the final at the local Baseball Ground. Derby were close to pulling off what would have perhaps been the most remarkable come-back in the history of British baseball, but Nottingham Forest held on to claim what was their only ever baseball championship. Clapton beat Tottenham Hotspur in the first round and Woolwich in the semi-final before, at their home ground on Millfields Road on 17 August squeaking past Fulham to secure the title. Pemberton, Holmes 1. Fulham - Flint 3, Ford, Turner, Paige, Beans 1. L Strawson singled and advanced to 2nd, advanced to 3rd on hit by E Strawson, and scored on a hit by Avery. E Strawson singled, advanced to 2nd on a hit by Avery, advanced to 3rd on a hit by Gull, and was out at plate on grounder by Henbest (Flint [p] to Beans [c]). Avery singled, advanced to 2nd on a hit by Gull, could have been out at 3rd on Beans [c] to Holland [3b] but the throw was muffed, and scored on that muffed throw. Gull singled and scored on that muffed throw. Henbest grounded back to the pitcher and reached on a fielder’s choice. L Strawson had relieved Holmes at the end of the 6th and thus got win. Leyton had knocked out the defending champions, Clapton Orient, in a 1-run semi-final, edging past them 4-3 in the final inning, but were then on the losing end of a 1-run game in the final. Spurs claimed it 6-5 for their second title in three seasons. Clapton Orient were reported to have lent Tufnell Park a few players in their first-round cup game as they were missing several key personnel, but still emerged victorious. Crystal Palace won through the first round to set up a home game against Clapton Orient on 5 August. Leyton beat West Ham and advanced to the final, scheduled for 19 August, on a bye. The final took place on 19 August at Leyton Football Club’s ground. Searsdorfer got Palace off to a strong start, doubling in the top of the first, but they could not take advantage. It was a game settled by a single run. The cup final in 1934 was contested between two division two sides from the Liverpool area. Eslewhere in the third round, Hatfield disposed of New Brighton II 27-6, while a local report observed that: “Bootle Celtics look likely winners of the N.B.A. Challenge Cup on their form against New Brighton in the third round. It was an even game bringing together two of the most powerful exponents of the American game.” It finished 24-18 to Bootle. In Hatfield’s semi-final, on the evening of Monday 13 August at Wavertree, they gained a shock defeat over Avalons and went through to the final that Saturday, against Albion (described in the report below). 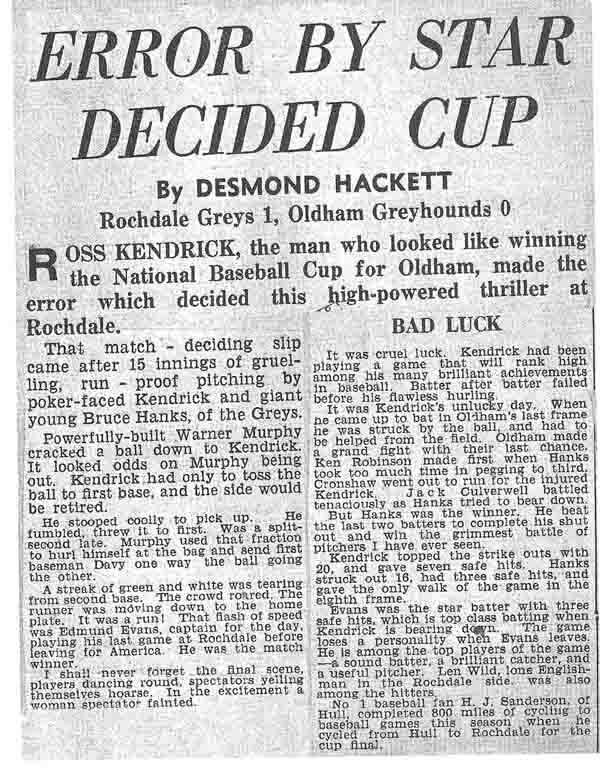 The story of the incredible 1938 final, in which British Baseball Hall of Famer Ross Kendrick duelled with Bruce Hanks for 15 frames, deserves to be told in full, as it is in the report below.